I am calling all fitness fanatics, to lend me a helping hand with little research. I have decided to start “Msalonen: Gym Tours”. This idea came to head last night after an fanstastic event at The ICA. I had just been to the gym with my dear friend Chris, he goes to a very fancy gym in town. I wont name it yet, as I will of course do a little write up in the next few days. However, so the this is the idea. I would like to start doing rounds at great gyms in London, or anywhere in the Uk. You know what, let’s make it Global. I want to see what else there is on offer, can I find climbing walls, military training, floor to ceiling windows, medicine balls, kettle bells, power clubs? Ooooh. this is exciting. I want skipping ropes and indoor skating tracks and jump rope. Ok, lets not get excited. Too late! My dearest readers, this is where YOU come in. I need your help. As I can’t just walk into any gym in town, country, world, I need you lot to take me. If you think I might enjoy working out at your gym. Invite me and I will come. In return you get to see how I train. I train to the max. Go hard or go home. End of. I am sure I can teach you a trick or two and perhaps we can have few giggles and share interesting facts about life over a protein shake afterwards. If you want to take part, just get in touch. Bring it on! People of the world, I have coined a new term,SkinnyFAT. I’m thinking I should give you all a little background and how I came to create this new term. You know me,obsessed with the gym. If I haven’t hit the gym at least five times on any average week, I start going a little nuts so to speak. I work hard on this body of mine and take great pride in what I have achieved. However, the last month. Yes,month I have been slacking off. First I wasn’t feeling 100% and then just couldn’t be asked to go lift weights,much to my PT’s dismay. Thank god she lives far far away. Phew. So the last month I have been going to the gym maybe twice a week. Most people would call this “maintaining”. I call it slacking off and have had numerous conversations with myself,trying to boost myself to go and work it out. These conversations haven’t helped really. SkinnyFAT is when I gym toned (athletic,a body that could model underwear) starts to lose its tone. See,I don’t get fat if I skip the gym, I lose muscle and definition in a catastrophic rate and become flabby,yet thin. This confuses me greatly and have not found a word to describe it,so had to make one up. Easy. I totally understand people who don’t excercise and get fat. That’s given if you eat pizza and chips and lay on the couch. However,these people don’t understand people like me (most people don’t), for me losing weight is the worst thing that can happen. I rather put on a stone than lose couple of pounds. I know I can lose a stone within days,but gaining couple pounds takes weeks. Currently I am on my SkinnyFAT phase. I know I’m not fat. I know I’m not thin either. I guess most people would call me “athletic”. I am looking a little too lean for my liking and flabby. My six-pack is looking a little sad and this causes great distress. Now you are all thinking that I have finally lost my marbles. Just remember that flabbyness is relative too, just like muscle gain. I am dead serious. For most people looking good and feeling great isn’t on the same level as it is for me and my fitness dedicated friends. We often talk about how society discriminates fat people, on the same level we are so sick and tired of justifying our way of living. Clean eating, exercising to the limit of being obsessed and no drinking. However, all the above I have slipped in the last month and I hate myself for it. I miss the buzz from the gym. I miss the energy and the immediate results after an ab workout. UGH! I miss feeling great and looking like I could be in a Aussiebum advert. Dont get me wrong, I know my body rocks even on SkinnyFAT phase, however, rocking or not, it isn’t “good enough” for me. Therefore, I have now made a plan. Back to my bionic self with PRIDE. Lift or go home. Do or die. Can Men Be Fat AND Fit? Dear gym bunnies, running addicts and general fitness freaks. I am shamed to say that the last almost two weeks I have not been in any state to continue to hold onto my “bionic” status. This is due to feeling a bit under the weather and all sorts of birthday celebrations. However, this weekend I returned to the gym with vengeance. The plan was to RULE and I of course did. Started back with a little cardio, beastly leg work out and threw in 5 min of abs for the fun of it. The following evening I started to feel the pain, the stiffness that comes with a heavy workout. I could barely walk. This is of course due to the fact that I hit my leg weights at the same level as I had two weeks before, on a hindsight this may have not been the cleverest thing to do. As I was in agony from pushing myself a little too hard, I decided that little muscle ease would be in order. 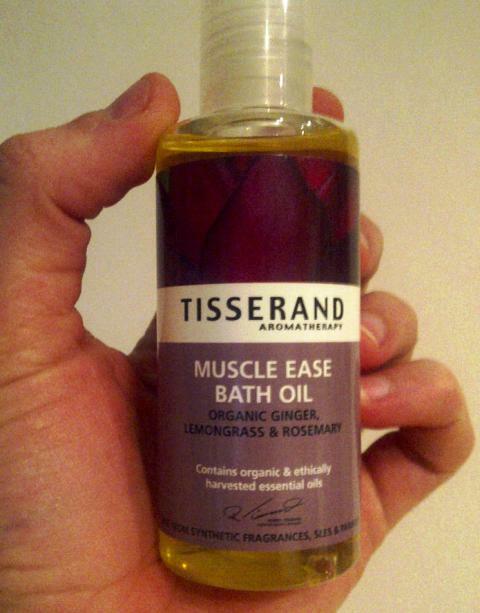 Enter, Tisserand Muscle Ease Bath Oil. I loves it. This oil is perfection to help sore muscles when you truly buggered, excuse me my french. Tisserand prides themselves in only using pure essential oils, natural ingredients and nothing synthetic. Products are not tested on animals either, which is great news. The oil smells divine, ginger, lavender, peppermint oils to name a few. As I laid in the bath, I could feel my legs relaxing and starting generally feeling “chilled”. Loved it. They also do a Muscle Ease Massage Oil, which of course will help to ease even further. The next morning I woke up and my legs felt like they had a workout the day before, but nothing like they would have without this bath. Comes highly recommended to all my marathon runner friends and general gym bunnies. Give it a go, you will love it! Few weeks back I stumbled across a cream called CSS and as I know many of my readers are almost as fitness obsessed as me, I thought we should put this cream to a test. Not only did I try it myself I urged my marathon training friend Heidi Hollywood to do the same. Her next “project” as she calls it is to run the Paris marathon and last Sunday she run 19 miles, just as part of her training. I don’t know how you people train for marathon’s, let alone run one. Total respect to Heidi for pushing herself. As I only run little diddly runs, I knew I was going to be happy with the cream, the real test was Mrs Hollywood. All the runners out there will most likely suffer from blisters, cracked feet and mangled toes, right? The first two CCS is great for and I have good surgeon numbers re: mangled toes. The first time I used the cream, I thought it felt like a luxurious treat, thick cream which sinks in quickly. This pleases me to no end as I hate having sticky feet. UGH. I really enjoyed using the cream and did feel like it made a difference in the condition of my feet. They were much softer and didn’t feel as tired after a my beastly step workouts. Marathon Runner, Heidi Hollywood says: “So the cream sure helps keep the feet smooth which is really important as it prevents blisters forming. This becomes really important a few months before the big day when you are training four times a week and your long runs are 15+ miles. Your feet have very little time to recover in between runs so an intense foot cream is an absolute must. This cream is perfect – it is thick in texture but sinks quickly and really helps repair the skin on the feet. The message is – Runners – look after your feet!!! You don’t want them to let you down on your big day!! If you are suffering from cracked heels, you can get your own tube of CCS from Boots and other retailers nationwide and for more info just log onto CCS Professional Foot Care! This morning I decided that since it was February 1st, it was time for me to crank it up a notch and try my new trainers for my morning cardio! I do 25min of step few times per week to keep myself looking like I do. Got the trainers on the weekend and for some reason forgot about them, until this morning. The new Nike LunarGlide +2. OMG! Firstly the color will wake you up at 6.15 quite nicely. 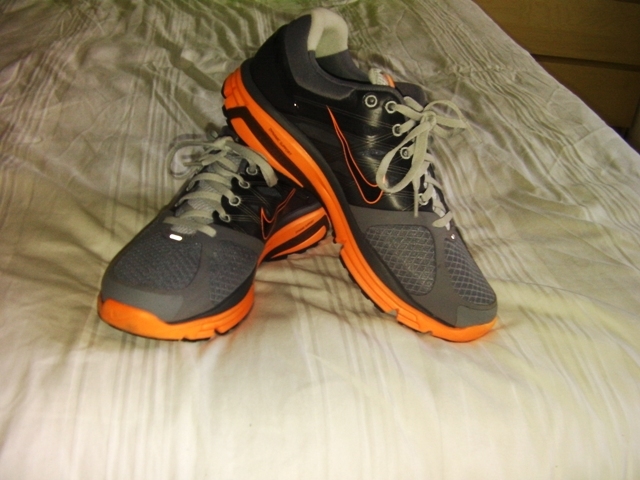 These were designed for running, but since I can’t bring myself to run pre 7am, the step was going to be the testing ground. I is very happy indeed. The trainers weight absolutely nothing. Nada. Light as a feather (which makes me think I can do 10k in 40min this weekend), great support on the feet. Sturdy without being too restrictive. I am in LOVE. You can of course set up your iPhone for Nike+ and all that jizzle. Test 1, The Step – Passed with flying colors. Step 2 – The Run, results reported once test is finished. Thank you Nike for making me fierce trainers, my glutes thank you for the support.